President suspends a new ozone requirment after fierce criticism from Republican lawmakers -- and after the economy posts zero new jobs in August. NEW YORK (CNNMoney) -- After weeks of Republican attacks on the Obama administration's tightening of environmental regulations, the president said Friday he would halt a planned increase in clean air standards. In a statement released just hours after the U.S. Labor Department said the economy created no new jobs in August, Obama said he told Environmental Protection Agency head Lisa Jackson to withdraw the draft Ozone National Ambient Air Quality Standards. While stressing his environmental record, Obama said he has "continued to underscore the importance of reducing regulatory burdens and regulatory uncertainty, particularly as our economy continues to recover." Reaction on both sides of the debate was swift and sharp. "It's probably the only decision to make in light of the bleak jobs numbers today," said Ross Eisenberg, environmental and energy counsel for the Chamber of Commerce. "We don't need the added costs, we don't need the uncertainty on business right now." "The President's decision is good news for the economy and Americans looking for work," American Petroleum Institute President Jack Gerard said in a statement. "EPA's proposal would have prevented the very job creation that President Obama has identified as his top priority." But others said it was was bad move for the nation's health. "The White House is siding with corporate polluters over the American people," Frances Beinecke, president of the Natural Resources Defense Council, said in a statement. "Our public officials, including in the White House, serve to protect us from harm. They need to get on with doing their jobs." The administration's "final decision not to enact a more protective ozone health standard is jeopardizing the health of millions of American, which is inexcusable," Charles Connor, head of the American Lung Association, said in a statement. 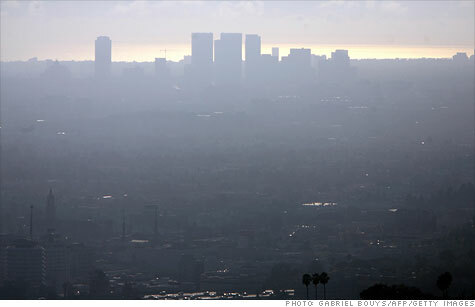 Ground-level ozone, similar to smog, is created by the burring of fossil fuels. The compound is linked to respiratory disease and thousands of premature deaths each year. According to the Environmental Protection Agency, increasing the standard would save 4,300 lives per year, prevent 7,000 hospital visits and avoid 2.6 million missed days of work or school. The agency predicts that a higher standard would cost $25 billion per year, but yield $37 billion in benefits, like eliminating those missed work days. The administration had been attempting to tighten the standards regarding how much ozone can be in the air. But those efforts have been met with stiff resistance by lawmakers concerned over their effects on the economy. Earlier this week, House Majority Leader Eric Cantor called the proposed ozone rule "the most harmful of all the currently anticipated Obama Administration regulations." Areas of the country that do not meet ozone requirements are subject to constraints on development, which could include the denial of permits for new industries until filters or cleaner fuel can be used for existing activities. The Chamber's Eisenberg disputed the EPA's claimed benefits from tightening the standards. He said that while great progress has been made cleaning up the air over the last several decades, we're now at a point of diminishing returns -- the cost of cleaning up the remaining pollution outweighs the benefits. The Chamber pointed to recent testimony from several labor unions, which said the new clean air requirements on just the utility industry would result in the loss of over 250,000 jobs. Friday's decision did not sit well with Obama's core supporters. "Many MoveOn members are wondering today how they can ever work for President Obama's re-election, or make the case for him to their neighbors," said MoveOn head Justin Ruben in a statement. The administration is also trying to tighten a handful of other environmental and labor regulations, efforts that are also meeting stiff resistance in the Republican-controlled House of Representatives. On a conference call with reporters, White House officials said Friday's move to delay the ozone regulations should not be taken as a sign that the administration will give up on the other items. "The White House is looking increasingly at the political ramifications of tight environmental policy and trying to soften the blow whenever they can," Kevin Book, an analyst at ClearView Energy Partners, wrote in a research note Friday. "We would encourage clients to watch this space."